We Santooshini Infra Tech Pvt. Ltd has an experience more than a decay in Real Estate and Constructions, At present we have launched prestigious project "Brundaavan City" which is located at Shadnagar. Address: High Tension Lane Road, Nizampet, Hyderabad, Telangana, India. This Builder Profile page for "Santooshini Group" has been created by PropertyWala.com. 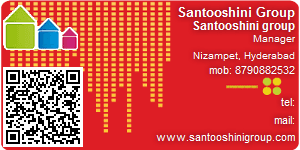 "Santooshini Group" is not endorsed by or affiliated with PropertyWala.com. For questions regarding Builder Profiles on PropertyWala.com please contact us.